“Horses are taught not by harshness but by gentleness.” Cavalry: Its History and Tactics, Captain L.E. Nolan, 1853. Anyone who reads my articles will probably notice a leaning toward the military and in particular the cavalry; a tendency certainly understandable for a retired soldier with a love of horses. 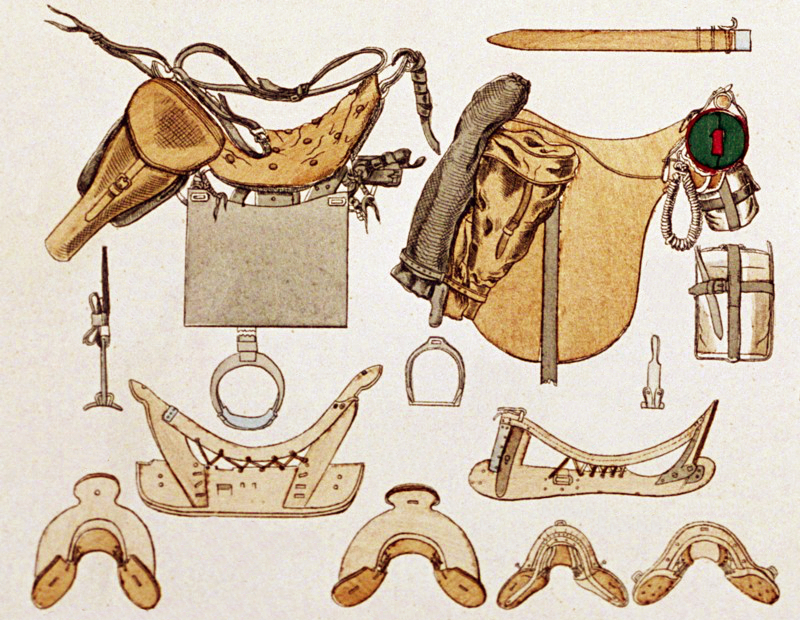 I received a request to do a piece about horse tack during the Victorian era, but the saddles, bridles, bits, and reins weren’t very different from modern English equestrian seats and accoutrements. However, the intricacies of the cavalry, which existed as common knowledge while Queen Victoria reigned, may prove a mystery to readers in our times. This article will serve as an explanation and glossary of the British horse soldiers and include pertinent foreign terms. 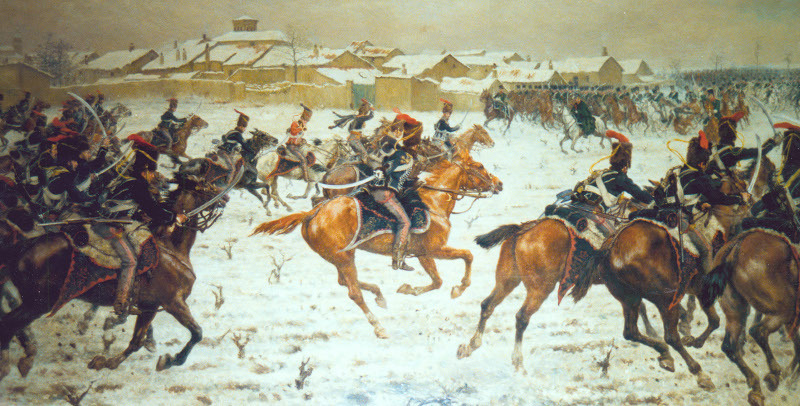 15th Light Dragoons, actually wearing their pelisses over their dolmans because of the cold, charging across difficult ground at Sahagun, Spain, 1808. The 15th, at a strength of 400 men, fought French regiments of twice their number. The French were utterly defeated. The cavalry inherited by Queen Victoria when she took the throne in 1837 was still very much resting on its laurels from the Napoleonic Wars (1803-15). During those years, the British heavy cavalry consisted of three regiments of guards, seven regiments of dragoons guards (1st to 7th), and five dragoons (1st to 6th less the 5th; disbanded for mutiny). The dragoons were sometimes considered a middleweight because they didn’t wear defensive armour. The light cavalry included twenty-one light dragoon regiments (7th to 29th) and two regiments of German cavalry. Campaigning on the Continent led to the British cavalry learning from their enemies and allies, adopting specialities, four regiments becoming hussars, and three lancers. The heavies didn’t wear breastplates into battle during the Napoleonic Wars, but did don helmets, and steel reinforced jackboots. After the wars many regiments were disbanded, the most junior retained being the 17th Light Dragoons. This was the cavalry on strength in 1837, and included; three Household cavalry regiments (The Guards), six dragoon guard regiments, four dragoon regiments, four light dragoon regiments, four hussar regiments, and four lancer regiments. By 1861 the heavies included three regiments of guards, three of dragoons, and seven of dragoon guards, while the lights were nine regiments of hussars and five lancers. Troopers of the 1st Dragoon Guards, 7th Hussars, and Royal Horse Guards, circa 1812. 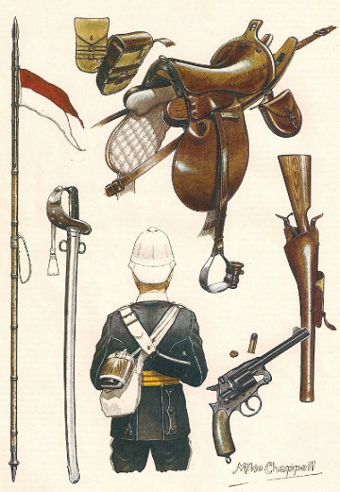 Note the helmets and jackboots on the dragoon and guardsman, the slung carbines of the dragoon and hussar, and the extremely long, heavy, hatchet-pointed sabre of the guardsman. As with any long spell of relative peace, the expertise of the veterans is lost. The fighting skills and practical common knowledge learned while on campaign slowly erodes until the average officer is more concerned with the cut of his uniform than the cut of his sabre. The troops become efficient at doing as little as possible as quickly as possible, while not giving combat any serious thought, concentrating on garrison duties. Queen Victoria’s cavalry looked fantastic on parade, but by the time the regiments were called into action for the Crimean War (1853-56) they were a far cry from the hardened terrors who charged against Napoleon’s legions. The Commanding Officers of the 1840s wanted tall men in their regiments, believing the goodness of the cavalry consisted exclusively in the “height of the man and horse” whether they could ride and handle a sabre or not. Some officers who soldiered abroad and then returned to British regiments decried the lack of professionalism. Probably the most renowned was Captain L.E. Nolan (1818-54) of Charge of the Light Brigade at Balaclava fame. Nolan served with the 10th Austrian Hussars in Austria, Hungary, and Poland, then transferred to the British 15th Light Dragoons, knowing they were about to deploy to India. (The Austrian Army refused his resignation and he wasn’t stuck off their roles until 1899.) He studied cavalry tactics and was well known for his outstanding horsemanship. By 1853 Nolan was back in Britain, promoted to captain, and had written two books on horse care and cavalry theory. Officers of the 3rd Light Dragoons 1840, 10th Hussars 1844, and 16th Lancers 1846, clearly revealing glamorous and impractical uniforms harking back to the Napoleonic Wars. Note the long stirrups and straight legs of the men depicted, their heavily embroidered and ostentatious sabretaches and shabraques. Nolan wrote that the ideal hussar or dragoon be; “active, intelligent, and quick-sighted… with great physical strength… not exceeding five feet four inches.” He felt their equipment should be minimal, and was a great proponent of wooden scabbards, echoing General Sir Charles Napier (1782-1853); “The cavalry steel scabbard is noisy, which is bad; it is heavy, which is worse; and it destroys the weapon’s sharp edge, which is worst.” (The steel scabbards were handy cudgels, and useful in defence if a sabre blade snapped.) Nolan felt uniforms should be simple and practical, the exact opposite of the elaborate costume he wore as a member of the 15th Hussars. He felt a soldier could be well-dressed and smart in appearance donning a plain outfit, but with distinctive colours to differentiate regiments, particularly important after a charge or skirmish and a rally is sounded. “To me it appears that we have too much frippery – too much toggery – too much weight in things worse than useless.” He then went on to list plumes, bandoliers (the decorative shoulder belt and cartridge pouch of the era), sabretashes, sheepskins, shabraques, &c., as useless when on campaign and having to “rough it.” Nolan felt a sort of metal bracer to protect the forearm would be beneficial, and steel strips sewn into the outside of the overall legs. In the use of lances he pointed out they were only effective at speed, the horses at full gallop, so the weapon should be retired. The horse furniture used by troopers in the mid 1800s hadn’t changed much from the Napoleonic era. Cavalry saddle trees (frames) were made of hardwood, entirely uncovered, and consisted of side-boards, with a front and rear arch or fork attached by mortises, and the underseat (also known as a wolf or straining strap) strung between them. The underseats were made of thick strong leather about 10 to 15 inches (25-38 cm) long, and roughly 4 inches (10 cm) broad at the hind arch, narrowing toward the front arch, usually secured by nails. Rawhide lacing ran along both sides of the underseat to the side-boards. The saddle seat, crafted of leather, padded and quilted, draped over the tree and underseat. There were variations in design between the branches of the mounted branches of the British army, in particular between the heavies and lights, but the above description outlines the basic saddle used during the Crimean War, and retained by some cavalry regiments up until the mid 1860s. However, the initial issue all-purpose saddle arrived in 1856. This new saddle, based on the designs of Nolan, was still a wood arched saddle with flaps, crafted to carry a total weight of about 220 lbs (100 kg). It served through the campaigns of the 1860s and 70s, and used by some territorial home guard (yeomanry) units until the end of the 1800s. The shape of the saddle brought the cavalryman closer to the horse, allowing improved contact between the rider’s legs and flanks of the animal. The previously applied stuffed pad was replaced with felt fastened to the side-boards and a blanket, alleviating the heat and stress suffered by the horses. The training of troopers to balance in the saddle with long stirrups (the legs straight) Nolan derided and recommended bent knees with firm squeezing of the thighs to ensure a safe seat. He criticized equitation schools that taught fancy dressage like croupades and caprioles, and suggested quick starts and stops and sharp turns (pirouettes) the most important skills to teach cavalrymen and to train their horses for the field of action. 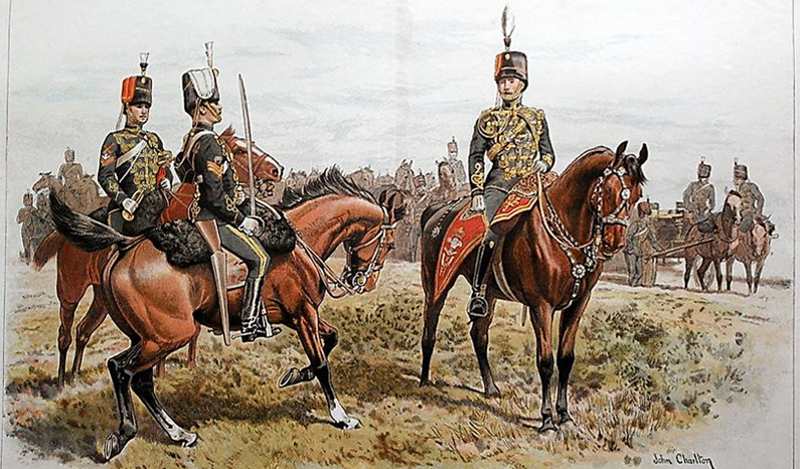 This drawing depicts Bavarian light and heavy cavalry saddles, but it is an excellent illustration and the models are similar to the British seats of the mid 1800s. A new saddle came into use in 1872, known as the Flat Iron Arch model; the first to be constructed with metal arches. It proved an utter disappointment, the arches spreading, which led to the seat resting on the horse’s spine. Experiments with metal led to the Angle Iron Arch saddle of 1878, which was trialled by the 1st Dragoon Guards and 17th Lancers during the Anglo-Zulu War (1879). It failed too, the men preferring the old wooden arched saddles. In the early 1880s steel was used instead on iron, leading to more improvements, and in 1891 the Steel Arched Universal Pattern Saddle Mark I appeared, followed by the Mark II (1893) and the Mark III (1898). These saddles were a success, with single piece seats, high cantles, and wider flaps, making them more similar to an English hunting saddle. 17th Lancers, 1870s, showing the practical multi-purpose uniform and kit that all British cavalry carried, less the lance. Khaki uniforms was the next step. 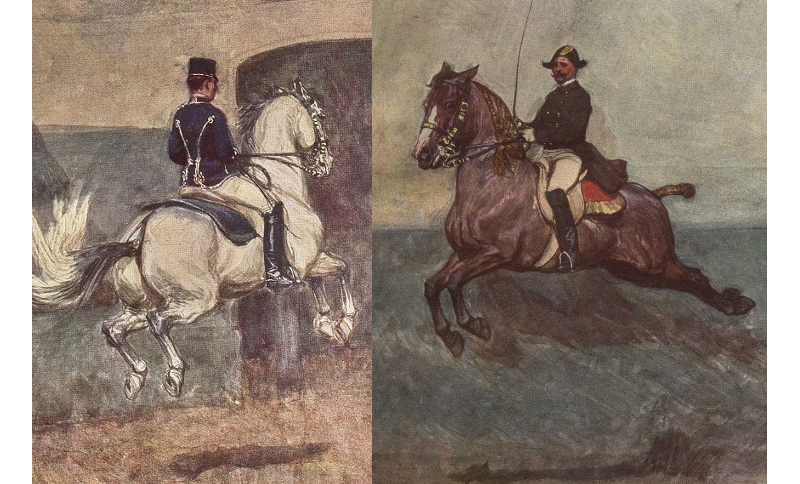 Regiments selected horses for uniformity; dark brown the most common. The Royal Scots Greys (2nd Dragoons), mounted on dapple greys, serve as the most obvious exception, but there was also the Queen’s Bays (2nd Dragoon Guards) who, of course, rode bays (reddish brown bodies with black manes and tails), and for awhile in the late 1800s a squadron of the 7th Dragoon Guards rode black horses. Captain Nolan served and died in the Crimea before his suggestions were adopted, but many of them shaped the cavalry of the 1860s and 70s as troopers became versatile mounted infantry. By the 1870s all the British cavalry regiments were carrying sabres, carbines and pistols, and some retained lances. Armour was only worn during ceremonial duties. Their uniforms became more practical with each passing campaign. However, despite the improvements, by the close of the Victorian era the cavalry role in combat had dwindled. Truly, it was the improvements of firearms that precipitated the removal of heavy cavalry and any sort of armour from the battlefield. British Army command realized only light fast troopers armed with a complement of weapons on decent horseflesh were to be of any use in modern warfare. In name and for ceremonial purposes the cavalry retained much of their traditions but, for the field and combat, practicality and common sense prevailed. Of course, the weapons and vehicles of the 21st century ensured the demise of mounted soldiers in warfare, and thank God for the poor bloody horses! 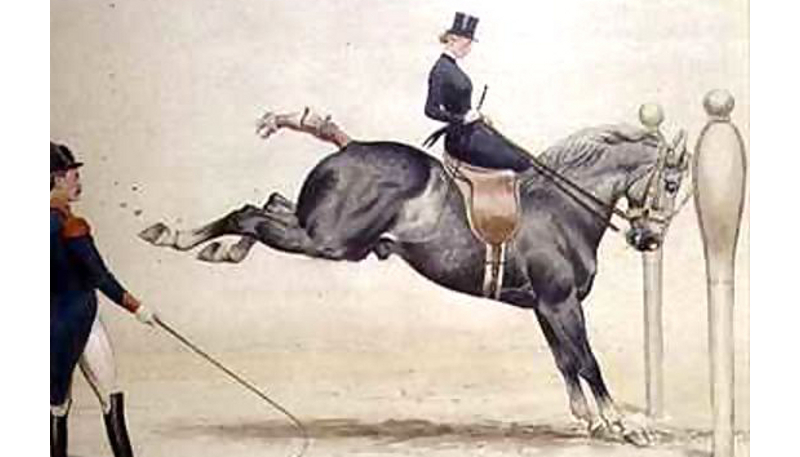 Kate Tattersall thought highly of the light cavalry, pretended to be a despatch rider as a child, and thought she possessed the necessary attributes and skills to be one as an adult, despite the restrictions of Victorian society. There are still some elite military units who are specialized for mounted patrolling, their horses exceptionally trained and valuable members of their respective armies. Ballotade; a French term for when a horse leaps straight up off all fours, bending both knees and hocks, showing its hind shoes without kicking out. A somewhat useless skill taught at some equitation schools throughout the 1800s as a step to training a horse for the capriole. Brigade; in regards to cavalry, indicated three or four regiments operating together, under the command of a senior colonel (brigadier). Busby; the hussar headdress, a cylindrical fur cap, having a bag of coloured cloth hanging from the top and down to the side, typically to the right within British regiments. Details of The Ballotade and The Capriole, Ludwig Koch (1866-1934). Capriole; a French term for when a horse leaps straight up off all fours, bending both knees and hocks, then lashes out with its hind hooves. A somewhat useless skill taught at some equitation schools throughout the 1800s, and a throwback to when warhorses were trained to kick and bite. Now-a-days taught for dressage shows. Carbineers; the first cavalry squadrons to be armed with carbines, when firearms were still quite new. This term was used within the British army more commonly in the 1700s. Croupade; a French term, during the 1800s it was used for when a horse hops and kicks back hard and high with its hind legs, or when a horse jumps up parallel to the ground with its legs tucked tightly under, as a step to training for the capriole. The Croupade With Posts, J.A.H. 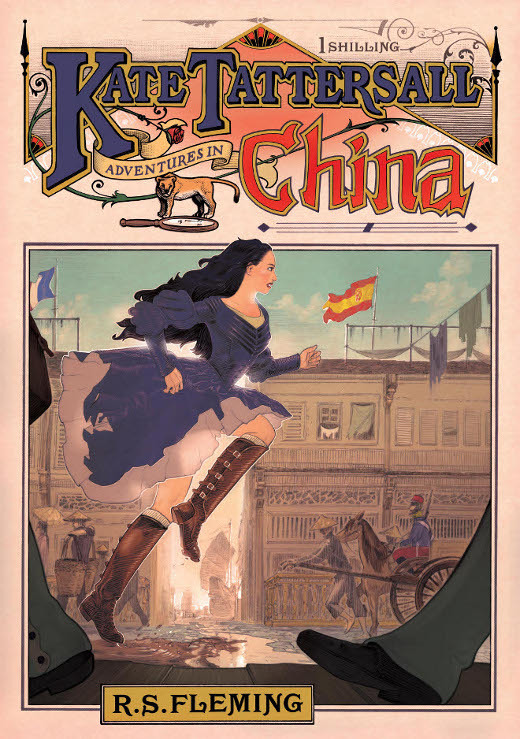 Bird (1846-1936), nicely shows a lady riding side-saddle on a powerful mount performing the kicks. Czapka; (plural: czapki) pronounced shapka, a Polish word for cap, evolved from a tall square topped shako worn by Austrian uhlans during the Napoleonic Wars; designed to protect from the downward stroke of a blade. During the Victorian era the lancer headdress took the form of a brimmed skullcap with the regimental crest on the front, the square of protective armour mounted above by a sort of stem. British soldiers called czapki lance caps. Chasseurs; French for chasers or hunters, a light regiment equipped for rapid movement, also a designation applied to certain elite infantry units. Chevaulegers; from the French for cheval (horse) and léger (light) to denote light cavalry regiments. The term was used by several European nations. Cuirassiers; a heavy regiment with troopers each wearing a cuirass (an armour breastplate and backplate) and usually helmets. 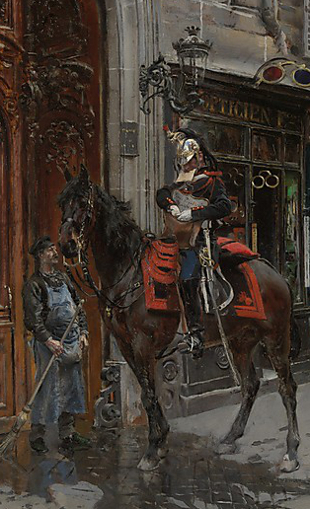 Detail of The Dispatch-Bearer, 1879, by Giovanni Boldini (1842-1931), shows a French despatch rider; a small active man on a superior mount. Despatch (dispatch) riders; usually small troopers with outstanding horsemanship abilities on superior mounts who act as message deliverers, sometimes over long distances, sometimes under fire in the heat of battle. Dolman; came from the Turkish word dolaman, which means robe, and was a long loose garment. By the Napoleonic Wars it was a military tunic, particularly for cavalry regiments, worn over a shirt. It was the day-to-day jacket, to which might be added a pelisse, a rain cape, or a greatcoat. Guards; heavy cavalry who wore defensive armour (breastplates and backplates, helmets, jackboots) and wielded the longest heaviest sabres, and rode the largest horses. 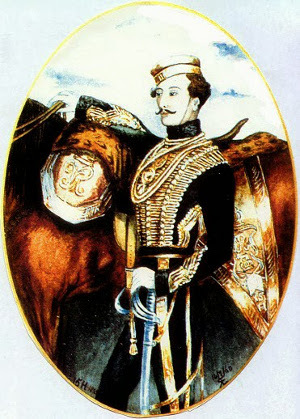 Hussars; from the Hungarian huszár, in Victorian times they were light cavalry, famous for elegant uniforms. Heavy hussars did exist in the Kingdom of Poland from the 1570s to 1776 when the regiments were reformed as uhlans. They were known as husaria, wore armour and carried lances, and made up the elite wing of the cavalry. 19th Hussars by J. Charlton (1849-1917). The men depicted in their dress uniforms, late 1800s, a corporal trumpeter on the left, a troop sergeant at centre with sabre drawn, and an officer on the right. They don’t have pelisses and wear the Austrian style dolman which was adopted after the Crimean War. Lancers; light regiments armed with lances and sabres, czapki headdresses. Light cavalry; average to small but strong men, mounted on fast nimble horses, skilled in the cut and thrust of skirmishing. The eyes and ears of an army, the tasks of advance patrols and reconnoitring, guarding the flanks and rear of the columns, cutting off the enemy’s supplies and communication, &c., fell to the light cavalry regiments. Pelisse; waist-length tightly tailored jackets, lined with fur and decorated with galloon, worn by hussar regiments. They usually were worn like a cape on the left shoulder and across the back to protect from sabre slashes, and known informally as slinging-jackets. They were very expensive pieces of kit, running about fifty guineas at the onset of the Crimean War. Regiment; two squadrons operating together, with a commander holding the rank of light or full colonel, who rides at the front of his regiment with the adjutant close by. Two majors command the flanks (the wing-leaders) and repeat words of command, their trumpeters sounding when ordered. All trumpeters join in during a charge or rally. The sergeant-major (most senior other rank) rides at the rear. Into the Valley of Death by J. Charlton, highlighting the 17th Lancers during the charge of the Light Brigade, Balaclava, 25 Oct 1854. After thrusting their lances into an enemy, they drew their sabres to skirmish with the Russian artillery. Sabretache; originally similar to a sporran and serving as a pocket, by the late 1700s it was a flat stiff leather case hung from a belt. By the mid 1800s they ranged from plain to fancy, some functional others purely decorative, worn by cavalry regiments, often to carry despatches on the battlefield. They contained paper and pencils, maps, ruler, &c, and served as a portable little writing surface. Shabraque (shabrack); a large cloth made to cover a cavalry saddle, crafted of regimental colours, rounded front corners and pointed rear corners, regimental crest or royal cypher on the rear corners. Upon the shabraque would be placed a sheepskin, bearskin, &c. for winter campaigning. Squadron; two, three, or four troops of cavalry riding together, commanded by a major (squadron-leader) or a senior captain (brevet major). The major leads from the front with captains on the flanks, and operate similarly as a regiment. The senior troop sergeant-major rides at the rear. An officer of the 8th Hussars, 1854, showing the busby, dolman, pelisse (slung), sabretache (red), and shabraque, all exquisitely trimmed and lavisly embroidered. A photo of Capt A. Hutton, 1st Dragoon Guards, 1871, in stable dress; a forage cap (pillbox) and stable jacket with hercules ribbon, toggle buttons, and soutache knot-work on the cuffs. Stable jackets; were crafted of very dark blue or black and designed to be worn by officers over their elaborate dolmans to protect them from dirt. They were long, coming to the knee, and became a favourite item for day-to-day wear. By the mid 1800s they were tricked out with galloon and other trim. Subaltern; a term for commissioned officers below the rank of captain, within the cavalry of the 1800s including coronets and lieutenants. Troop; the base cavalry unit of roughly forty to fifty men, commanded by a captain (troop-leader), assisted by two subalterns, discipline provided by a troop sergeant-major and his sergeants and corporals. The captain would lead, the subalterns taking positions on the flanks, each with a trumpeter behind them, the troop sergeant-major at the rear. Uhlans; from Turkish ōlan meaning a brave young man or warrior, this term was adopted by the Polish, German, and Austria-Hungarian armies to denote a light cavalry regiment armed with lances, sabres, and pistols. Vedettes/videttes; mounted sentries who patrol beyond an army’s outposts to observe the approach or movements of enemy forces. Usually light cavalrymen on superior mounts, like despatch riders. Robert Bontine Cunninghame Graham (1852-1936), Scottish adventurer, politician, journalist and writer. Do you give the horse his strength or clothe his neck with a flowing mane? He catches the scent of battle from afar, the shout of commanders and the battle cry. * Interestingly, all German cavalry regiments took up the lance, and carried them into WWI (1914-18), and the French Cuirassiers were still wearing armour at the start of that horrific conflict. Hi, this is a great reference. Thanks! Very Interesting subject matter, have you written any books? What a great time to be a trooper. Thanks for this.